I just submitted a new version of phytools (phytools 0.2-30) to CRAN. Hopefully there are no major issues and it is accepted promptly by the CRAN gatekeepers. ** If so, then it should percolate through the mirrored repositories over the next few days. 1. A function (untangle) to untangle crossed branches in mis-plotted trees. 2. A new user-requested funtion (writeAncestors) to write ancestral state estimates and CIs into a Newick string. 3. A rep function for phylogenies, repPhylo. 4. A new user-requested function to count transitions on a stochastic-map style tree, countSimmap - and updates to apply it to multiple trees in a "multiPhylo" object (1, 2). 5. A new, more flexible version of matchNodes. 6. A user-requested update to phylomorphospace to allow user control over the plotting dimensions, among other things. 7. A new version of plotSimmap (and, consequently, plotTree) for plotting leftward-facing trees. 8. Several significant updates to phenogram, to dramatically improve how labels are plotted in various ways (1, 2). 9. A new user-requested function to plot a tree with branches colored by the user-supplied or estimated states for a continuous variable, under various models (plotBranchbyTrait). 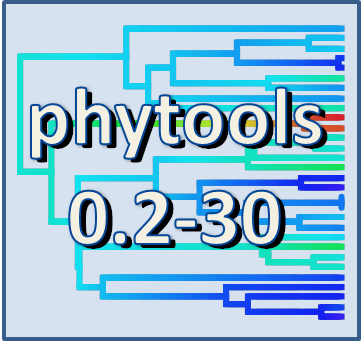 Because it wraps around ape's plot.phylo, rather than phytools' native tree-plotting functions, plotBranchbyTrait can also be used to plot trees of various styles. 10. A totally new (so far as I know) - but admittedly somewhat ad hoc - method for testing the hypothesis that the state of one continuous trait affects the rate of a second (ratebystate), along with a function to simulate under this model (sim.ratebystate). Although ad hoc, the method seems to work surprisingly well. 11. A new, totally re-written version of make.simmap, phytools' function for stochastic character mapping. This version fixes a bug (discovered after some feedback from Rich Glor) as well as dramatically improving computation time. 12. A new method in fancyTree (fancyTree(...,type="phenogram95")) for visualizing the uncertainty of ancestral states in traitgrams. As always, please don't hesitate to give me feedback with any bugs, problems, or suggestions about the present version of phytools. Thanks!